Acropolis CEO, Jonathan Bousfield, signed the contract for the newest member of the Airbus family with John Leahy, Chief Operating Officer, Customers and Benoit Defforge, Managing Director of Airbus Corporate Jets, at the European Business Aviation Convention (EBACE) in Geneva. “In finalising this order today, we are committing to providing our discerning clientele with the newest and ultimate large-cabin aircraft well into the next decade. Our current ACJ319 performs at the top of the spectrum of client expectations with the largest cabin in its class. 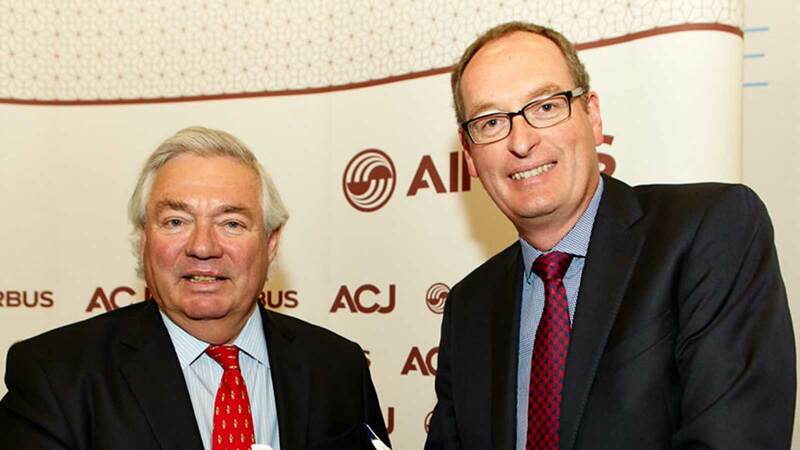 It is remarkable that the ACJ320neo will improve even further on these high specifications and standards,” said Jonathan. The new aircraft will have a range of 6,000nm/11,100km. With cabin space of 1,033 sq ft, 150 sq ft more than in the ACJ319, the ACJ320neo will have capacity for 140 bags and an even quieter cabin than the already super quiet ACJ319. It will also have an average lower cabin altitude of better than 6,400 feet, for improved passenger comfort. Farnborough, UK-based Acropolis began operations with the ACJ319 in 2010, and its aircraft G-NOAH, with its 19 luxury seats and VVIP cabin, is a highly regarded showcase for Airbus’ Corporate Jet fleet. “Our ACJ319 with its 10-hour non-stop range is extremely popular in the high-end charter market, especially in the Middle East, USA and Europe. With the new aircraft we will gain an improved range of 6,000nm/11,100km, which means clients can fly from London to Los Angeles Johannesburg or Tokyo direct and London to Sydney with one refuelling stop,” said Jonathan Bousfield.